About 6,000 students apply each year to the U.S. Department of Energy’s Science Undergraduate Laboratory internship program. With an acceptance rate of roughly only 15 percent, The University of Toledo’s Jeffrey Kodysh said he was ecstatic to beat the odds and secure a spot at the Oak Ridge National Laboratory (ORNL). 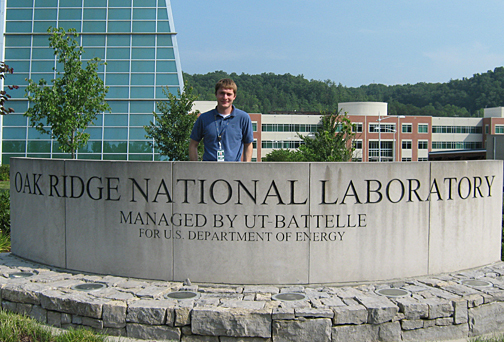 Jeffrey Kodysh posed for a photo by the Oak Ridge National Laboratory Sign. The 11-week internship running from early June to mid-August has Kodysh working with Light Detection and Ranging (LiDAR) technology to determine photovoltaic energy potential in urban areas. This effort will allow scientists to better estimate how much sunlight reaches areas in cities where photovoltaic arrays can convert it into electricity. 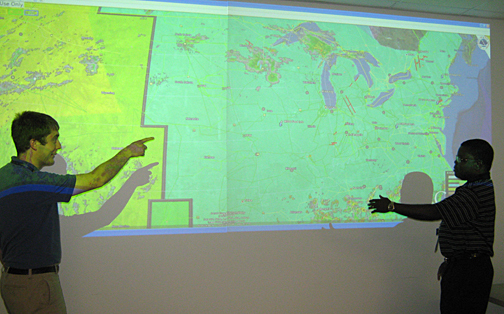 Jeffrey Kodysh and his mentor, Dr. Olufemi Omitaomu, look at the real-time visualization tool developed at Oak Ridge National Laboratory for monitoring the U.S. electric grid transmission system. LiDAR technology measures distances between objects with a laser, which is beamed from an emitter and bounced off targeted objects. The time it takes to return and the speed at which the laser beam is traveling is used to calculate the distance. This allows scientists to produce a three-dimensional model of the ground, including buildings. Exploiting these unused locations for solar energy collection is better than building photovoltaic arrays on land with other crucial uses such as farming, Kodysh said. Technically speaking, Kodysh is using his geography background to develop a new LiDAR-based methodology for calculating photovoltaic energy potential of specific buildings based on Geographic Information System technology. He will be taking into consideration photovoltaic limiting factors such as shading from trees or other buildings. Kodysh will use three-dimensional mapping software to look at the LiDAR data and determine what parts of buildings receive sunlight or shade throughout the day by simulating the sun’s path across the sky. This building-specific approach is part of a semiautomated methodology that can then be applied to whole cities. Even though the appointment is a prestigious one, two professors acquainted with Kodysh aren’t surprised he earned it. He said he hopes to incorporate the experience into his honors thesis — a requirement for graduation from the Honors Program, in which he is enrolled. Kodysh’s internship is administered by the Oak Ridge Institute of Science and Education. This entry was posted on Friday, July 16th, 2010 at 5:16 am and is filed under Research, UToday .